The Very Large Telescope (VLT), ESO’s flagship facility on Cerro Paranal in Chile, is made up of four giant Unit Telescopes (UTs), each sporting a mirror of 8.2-metre diameter, and four movable 1.8-metre Auxiliary Telescopes. 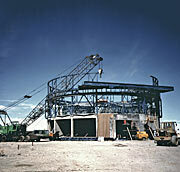 Our pair of photographs this month shows a Unit Telescope under construction, and one in the present day. Early work on the first Unit Telescope (UT1) enclosure can be seen in the historical image, taken in late October 1995. The concrete foundations were complete and the lower, stationary part of the enclosure’s metal structure had been fixed to them. The first pieces of the rotating part of the telescope enclosure were also in place — the beginnings of the wide slit through which the telescope would observe and the heavy, horizontal structure that would support the sliding doors can be seen towards the camera. 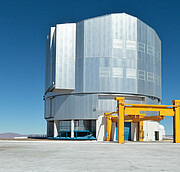 This Unit Telescope saw its first light on 25 May 1998 (see eso9820). 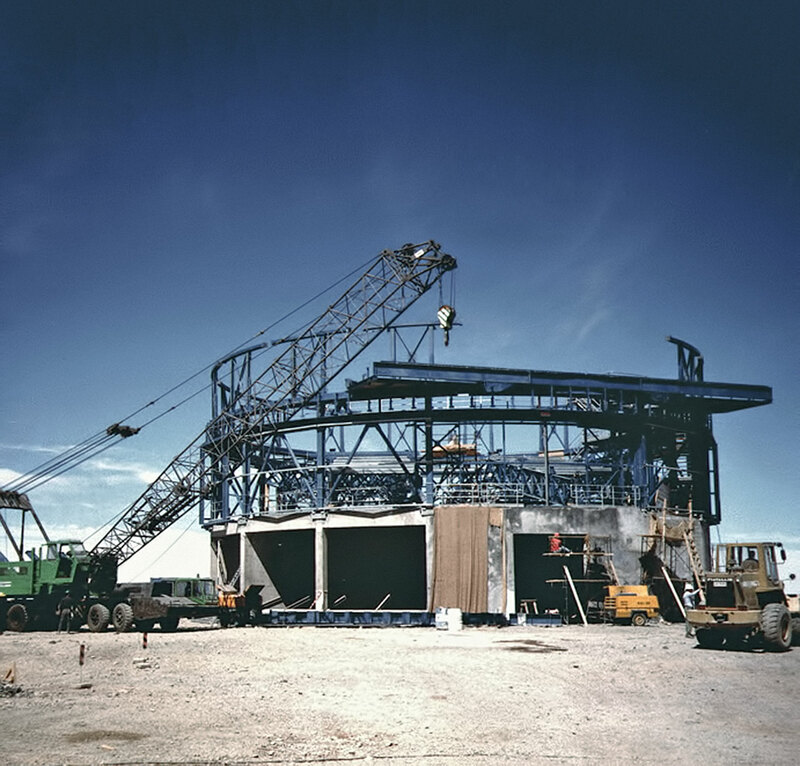 At the inauguration of Paranal in 1999 (see eso9921), each UT was given a name in the language of the native Mapuche tribe. The names — Antu, Kueyen, Melipal, and Yepun for UTs one to four in order — represent four prominent and beautiful features of the sky: the Sun, the Moon, the constellation of the Southern Cross, and Venus , respectively. The modern-day photograph is of UT4, Yepun, which saw its first light in September 2000 (see eso0028). 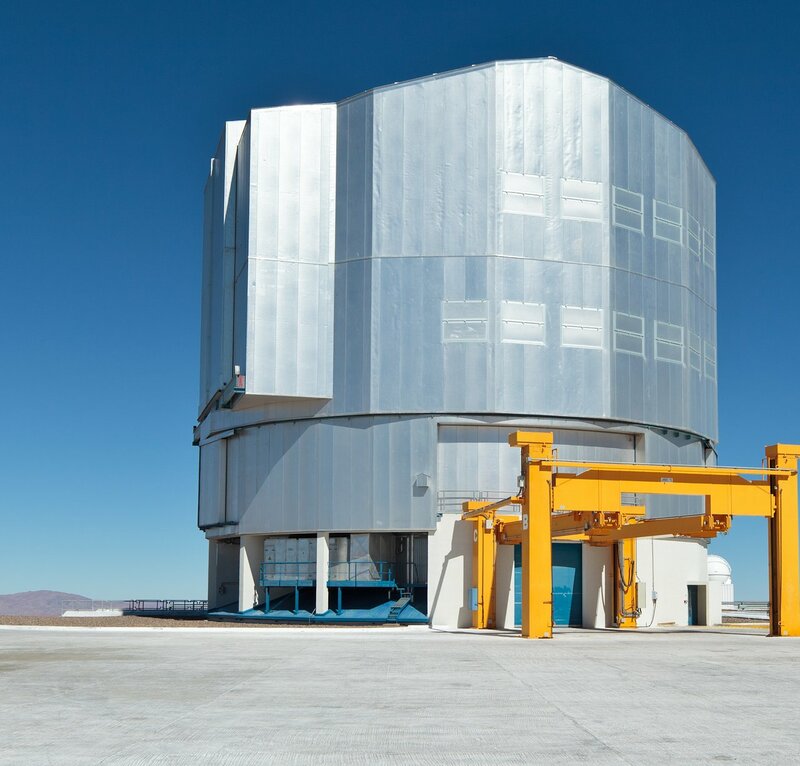 However, it serves just as well as its sibling UT1 to show the completed construction of the VLT, because all four UTs were designed to be identical. They differ only in the sets of instruments available on each, which give astronomers a wider range of tools to study the Universe. The yellow frame-like structure in front of Yepun is the M1 lifting platform, which can be moved between the UTs, and is used when their giant 8.2-metre primary mirrors are periodically removed and recoated. In the years since the historical photograph was taken, the first of the UTs has gained a name — Antu — and a family, as the other telescopes have joined it on the mountaintop. Today, the VLT is the world’s most advanced visible-light astronomical telescope, and Antu, Yepun, and the other telescopes on Paranal have played a major role in making ESO the world’s most productive ground-based observatory by far! Yepun had been translated as “Sirius” at the time of the Paranal inauguration (see eso9921), but subsequent investigation showed that its correct translation is “Venus”.